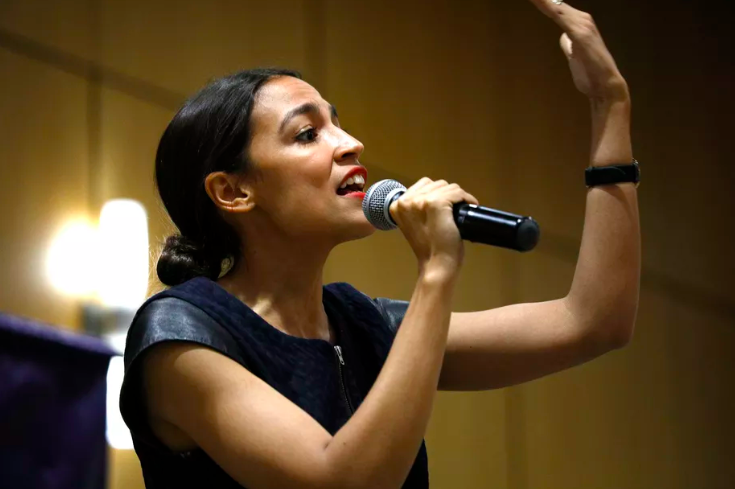 In an interview with Anderson Cooper, Rep. Alexandria Ocasio-Cortez proposed a marginal tax rate of 70 percent on all earnings over $10 million to finance a "green new deal." Some have criticized the new lawmaker's economic policy as ineffective and have accused her of taking too drastic an approach. Others emphasize that the top tax rate has been higher or just as high in the past and would not affect the middle class. From the Blog: The new Gillette razor ad has sparked intense debate over its perceived bias. Learn what the Left and the Right are saying about its portrayal of "toxic masculinity." Check out some other big stories this week: Steve King Loses Committee Assignments After White Supremacy Comments, Four Americans Killed in Syria in Bombing Claimed by ISIS, and Pelosi Asks Trump To Delay State Of The Union Address. "Many critics attempt to confuse people over what Ocasio-Cortez said. Just to be clear: she said that when people earn $10m, the 10 millionth dollar and above should be taxed at a high rate. So unless you earn $10m, she’s not talking about 'your' income. These are marginal tax rates, though the Republican party loves to trick people by conflating taxes that apply solely to the unfathomably rich with taxes that apply to ordinary workers." "It is true that, when the top marginal rate was last at 70 percent, there were more loopholes in the tax code enabling the affluent to sneak out of that top bracket. But this does not mean that Ocasio-Cortez’s tax policy would actually be more radical than Jimmy Carter’s was – after all, the congresswoman’s 70 percent rate kicks in at a much higher threshold, exclusively targeting America’s super-rich (who weren’t nearly as well off in the 1970s as they are now)." "Alexandria Ocasio-Cortez has begun a better tax debate, but we still need to close loopholes, not just raise rates." "The rap on high rates is that they discourage work and promote wasteful tax-sheltering. Even many economists who think the rich pay too little say the better solution is to eliminate loopholes—subjecting more income to taxation rather than taxing a narrow base at a high rate... On the other hand, economists supportive of Ocasio-Cortez were quick to point out that Denmark has among the world’s highest living standards despite a 56.5 percent tax rate on incomes above about $80,000 a year, a far lower threshold than her $10 million." "In the latest The Hill-HarrisX survey — conducted Jan. 12 and 13 after the newly elected congresswoman called for the U.S. to raise its highest tax rate to 70 percent — a sizable majority of registered voters, 59 percent, supports the concept." "Cooper asked her about her 'radical agenda,' such as getting the country to zero carbon emissions and increasing taxes on the wealthy to as high as 70 percent. 'I think that it only has ever been radicals that have changed this country,' she said." "Representative Alexandria Ocasio-Cortez’s call for a 70 percent income-tax rate to finance green-energy initiatives has energized the Left. Yet this is completely destructive proposal. A 70 percent tax bracket would raise very little (if any) revenue, while damaging the economy and sending income and jobs overseas." "Liberals, if you want to pay the 70 percent marginal tax rate, go right ahead. It's voluntary. Just pay It! Here’s how it would work: Everyone should sign a pledge to commit to a 70 percent tax rate. Then, you give all that money to the government and show us conservatives what it really means to you." "The best case scenario: a 70% rate would raise less than $300 billion in revenue over 10 years, which is less than half of the $700 billion that has been cited in press reports."